Thanks, Secret Pal! You're wonderful! I came home from work today and found my mailbox stuffed full of goodies. I'd recently ordered a cable to connect my cell phone to my computer, and that came today. There was also this lovely package from my very own Yarn Fairy! THANK YOU, THANK YOU! It contained some absolutely FABULOUS chocolate bars (my favorite flavors, too: chocolate/mint, chocolate/peanut butter, and chocolate/orange), some gorgeous Koigu yarn in shades of browns and pinks, and a sock pattern called "Fanning the Flame". 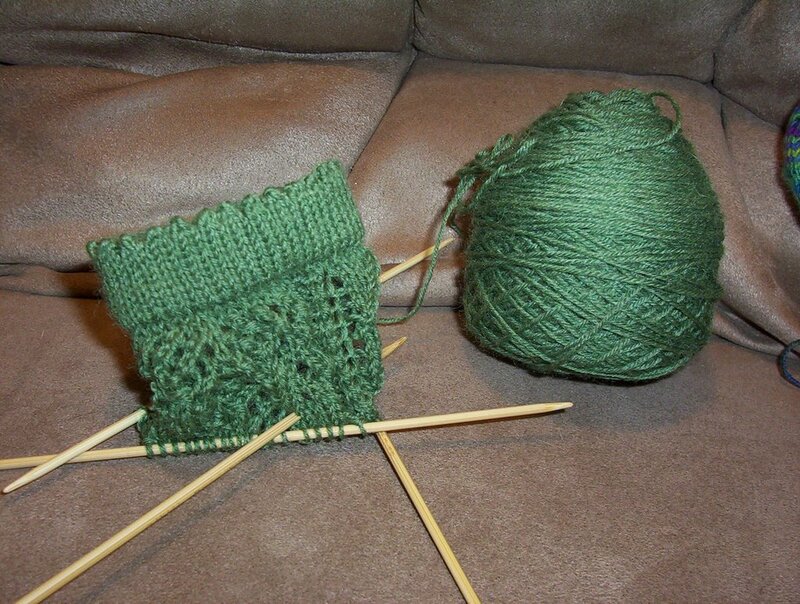 It looks quite challenging: the socks are constructed fan by fan, rather than in a continuous spiral. I'm excited to start (especially with that yummy Koigu yarn!) 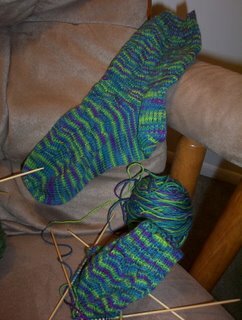 but I've got a long list of socks to finish first: the Crazy Colors socks, the Lace Leaf Socks, and my Mom's Wild Blue socks (which I have-ahem-yet to buy the yarn for). Thanks again, Pal! How does that nursery rhyme go? Something about "one sock off and one sock on" right? I'm back from my short vacation. I still have tomorrow off before I go back to work, but I came home early because I need to get some chores done before I run out of free time. 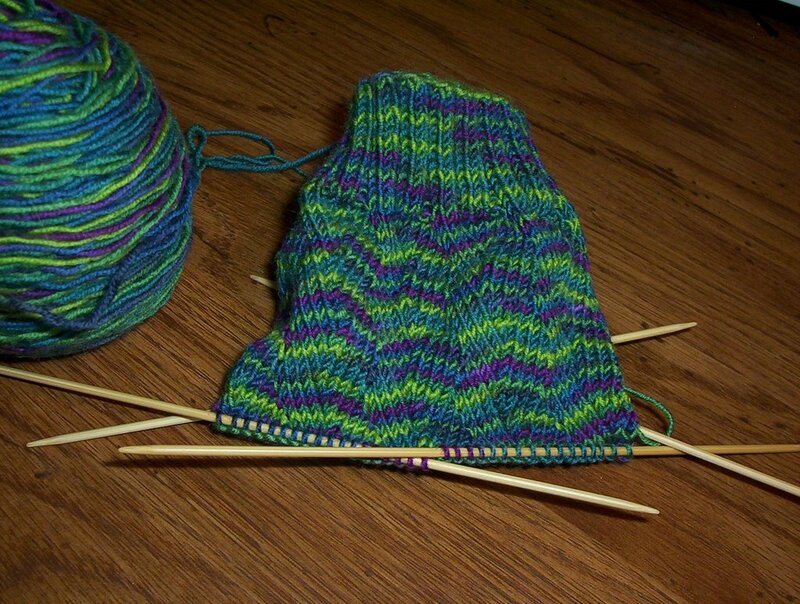 I finished one sock while I was up at my parents' house. 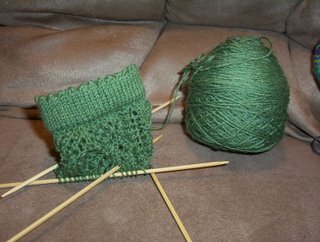 I underestimated how much knitting time and zen I would have and didn't bring the second ball to start the second sock. Oops. On a positive note, I really like how this sock turned out. I gave my sister the Jaywalkers I made for her birthday (and never got around to sending...) Now my mom wants some socks. Bright blue ones. 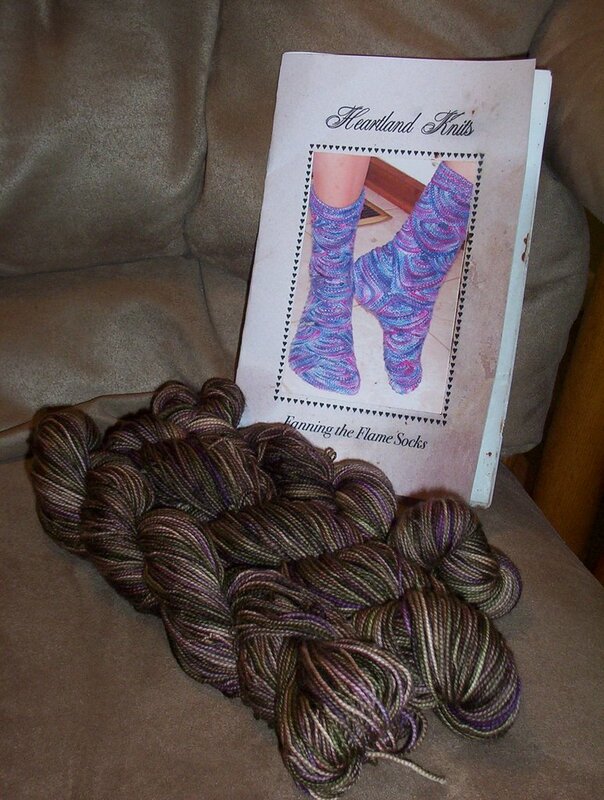 Fine with me--I can always use an excuse to buy more yarn and start more socks. I like the occassional commission. It gives me my "new yarn and new project" fix without guilt! It feels GREAT knowing that I don't have to go into work tomorrow, or the next six days after that! Next Wednesday won't be so much fun, but I'll ignore that gloomy thought for as long as I can. Tomorrow morning, I'm driving to Indiana to visit my family for a week. My brother is coming home from his mission in Brazil and I CAN'T WAIT to see him! Sometimes July 2004 seems like forever ago, and yet at other times, 2 years never seemed to go so quickly. So I won't be posting for a week or so. 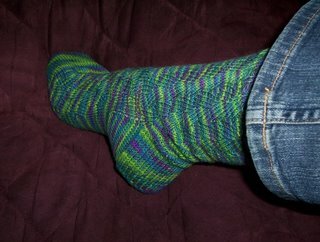 Before I go, I thought I'd better put up a picture of the Lace Leaf Sock I've been working on for weeks. So far, so good--I've not frogged it yet, which is marked improvement over most of my projects. What a great day! I came home from work and found a key in my mailbox, which is always exciting. It opens one of the two package boxes below the residents' boxes. Thank you, Yarn Fairy! 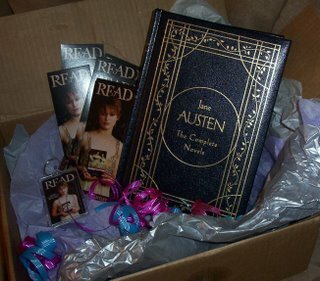 The package contained a lovely edition of "Jane Austen: the Complete Novels" and some yummy chocolate, and bookmarks and a keychain! Lovely! But no pictures to show for it. 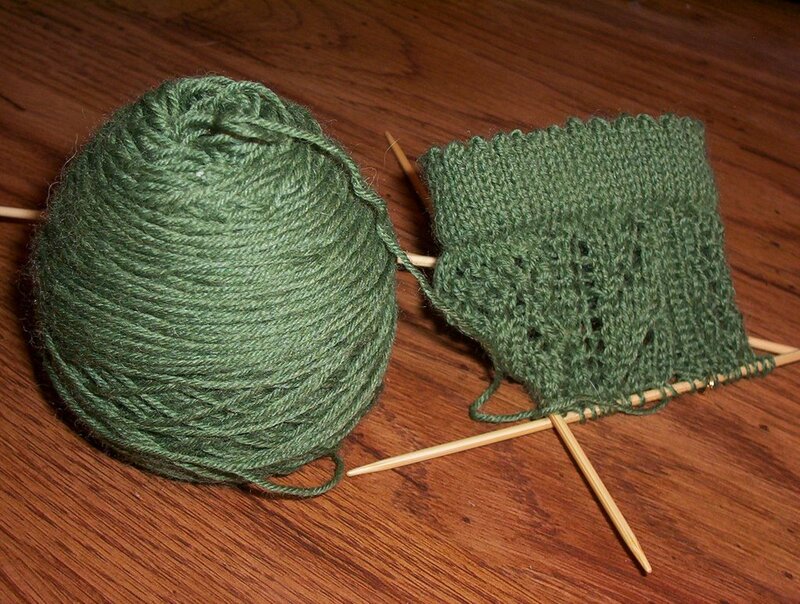 I'm working away on the Falling Leaves socks that I got from my wonderful Secret Pal (thanks again!). It's really enjoyable. It's interesting and I'm learning new things. I've never done a picot edging before. It took me a couple of tries to figure it out. Has anyone ever done this pattern before? 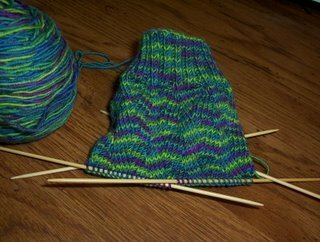 When the instructions say "work charts for 7.5 inches" before setting up for the heel flap, does that 7.5 inches include the picot edging, or just the stitches knit from the charts? I suppose it really depends on how long you want your socks, right?